We had a great AMS meeting this weekend at UCR, with far too many interesting talks going on simultaneously. For example, there were two sessions on math related to knot theory, one on operator algebras, one on noncommutative geometry, and one on homotopy theory and higher algebraic structures! If I could clone myself, I'd have gone to all of them. I'd like to discuss some of the talks, and maybe even point you to some videos. But the videos aren't available yet, so for now I'll just summarize my own talk on "Who Discovered the Icosahedron", and some geometry related to that. I'll conclude with a puzzle. But first - the astronomy pictures of the week! The bright white splotches are star-forming regions. The greenish wisps are hot interstellar gas. The red clouds are dust and organic molecules like polycyclic aromatic hydrocarbons (see "week258"). The darkest patches are regions of cool dust too thick for Spitzer to see through. This was taken by Swift, NASA's ultraviolet satellite telescope. At this frequency, young hot stars and dense star clusters dominate the view. It's sort of ghostly looking, no? Now for my talk on the early history of the icosahedron. I'm not sure it's really anything close to the first "realization of an entity that existed before only in abstract thought". But it may have been the first "exceptional" object in mathematics - roughtly speaking, an entity that doesn't fit into any easy pattern, which is discovered as part of proving a classification theorem! Other exceptional objects include the simple Lie group E8, and the finite simple group M12. Intriguingly, many of these exceptional objects" are related. For example, the icosahedron can be used to construct both E8 and M12. But the first interesting classification theorem was the classification of regular polyhedra: convex polyhedra with equilateral polygons as faces, and the same number of faces meeting at each vertex. This theorem appears almost at the end of the last book of Euclid's Elements - Book XIII. It shows that the only possibilities are the Platonic solids: the tetrahedron, the cube, the octahedron, the dodecahedron and the icosahedron. And according to traditional wisdom, the results in this book were proved by Theatetus, who also discovered the icosahedron! In this book, the 13th, are constructed the five so-called Platonic figures which, however, do not belong to Plato, three of the five being due to the Pythagoreans, namely the cube, the pyramid, and the dodecahedron, while the octahedron and the icosahedron are due to Theaetetus. Theaetetus seems to have filled the gap: he worked on solid geometry between 380 and 370 BC, perhaps inspired by Plato's interest in the subject. He died from battle wounds and dysentery in 369 after Athens fought a battle with Corinth. But how certain are we that Theatetus discovered - or at least studied - the icosahedron? The only hard evidence seems to be this "ancient note" in the margins of the Elements. But who wrote it, and when? First of all, if you hope to see an ancient manuscript by Euclid with a scribbled note in the margin, prepare to be disappointed! All we have are copies of copies of copies. The oldest remaining fragments of the Elements date to centuries after Euclid's death: some from a library in Herculaneum roasted by the eruption of Mount Vesuvius in 79 AD, a couple from the Fayum region near the Nile, and some from a garbage dump in the Egyptian town of Oxyrhynchus. There are various lines of copies of Euclid's Elements. Comparing these to guess the contents of the original Elements is a difficult and fascinating task. Unfortunately, in the fourth century AD, the Greek mathematician Theon of Alexandria - Hypatia's dad - made a copy that became extremely popular. So popular, in fact, that for many centuries European scholars knew no line of copies that hadn't passed through Theon! And Theon wasn't a faithful copyist: he added extra propositions, lengthened some proofs, and omitted a few things too. It seems he wanted to standardize the language and make it easier to follow. This may have helped people trying to learn geometry - but certainly not scholars trying to understand Euclid. In 1808, Francois Peyrard made a marvelous discovery. He found that the Vatican library had a copy of Euclid's Elements that hadn't descended through Theon! This copy is now called "P". It dates back to about 850 AD. I would love to know how Peyrard got his hands on it. One imagines him rooting around in a dusty basement and opening a trunk... but it seems that Napoleon somehow took this manuscript from the Vatican to Paris. 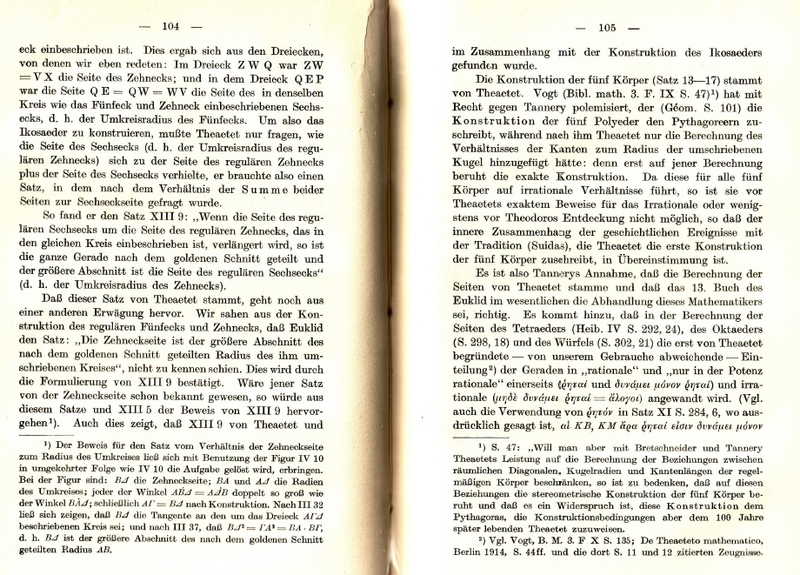 In the 1880s, the great Danish scholar Johan Heiberg used "P" together with various "Theonine" copies of the Elements to prepare what's still considered the definitive Greek edition of this book. The all-important English translation by Thomas Heath is based on this. As far as I can tell, "P" is the only known non-Theonine copy of Euclid except for the fragments I mentioned. Heath also used these fragments to prepare his translation. This is just a quick overview of a complicated detective story. As always, the fractal texture of history reveals more complexity the more closely you look. Anyway, Heath thinks that Geminus of Rhodes wrote the "ancient note" in the Elements crediting Theatetus. I'm not sure why Heath thinks this, but Geminus of Rhodes was a Greek astronomer and mathematician who worked during the 1st century BC. Once upon a time there was no problem in the history of the regular solids. According to Proclus, the discoveries of Pythagoras include "the construction of the cosmic solids," and early historians could only assume that the subject sprang full-grown from his head. But a better-developed picture of the growth of Greek geometry made such an early date seem questionable, and evidence was uncovered suggesting a different attribution. A thorough study of the testimony was made by E. Sachs, and her conclusion is now generally accepted: the attribution to Pythagoras is a later misunderstanding and/or invention. "In this book, the 13th, are constructed the 5 figures called Platonic, which however do not belong to Plato. Three of these 5 figures, the cube, pyramid, and dodecahedron, belong to the Pythagoreans; while the octahedron and icosahedron belong to Theaetetus." Theaetetus lived c. 415-369 B.C., so this version gives a moderately late date; and it has the considerable advantage of seeming unlikely. That is, the details in the scholium are not the sort of history one would naively conjecture, and hence it is probably not one of the stories invented in late antiquity. As van der Waerden says, the scholium is now widely accepted "precisely because [it] directly contradicts the tradition which used to ascribe to Pythagoras anything that came along." But probability arguments can cut both ways, and those scholars who hesitate to accept the scholium do so primarily because it seems too unlikely. There have been two main sticking places: first, the earliness of the dodecahedron in comparison with the icosahedron; and second, the surprising lateness of the octahedron. The first objection, however, has been fairly well disposed of. The mineral pyrite (FeS2) crystallizes most often in cubes and almost-regular dodecahedra; it is quite widespread, being the most common sulphide, and outstanding crystals are found at a number of spots in Italy. Moreover it regularly occurs mixed with the sulphide ores, and underlying the oxidized ores, of copper; these deposits have been worked since earliest antiquity. Thus natural dodecahedra were conspicuous, and in fact they did attract attention: artificial dodecahedra have been found in Italy dating from before 500 BC. Icosahedral crystals, in contrast, are much less common. Hence there is no real difficulty in supposing that early Pythagorean geometers in Italy were familiar with dodecahedra but had not yet thought of the icosahedron. The puzzle of why the octahedron showed up so late seems to have this answer: it was known earlier, but it was no big deal until the concept of regular polyhedron was discovered! As Waterhouse says, the discovery of the octahedron would be like the discovery of the 4rd perfect number. Only the surrounding conceptual framework makes the discovery meaningful. Although they are termed Platonic solids there is convincing evidence that they were known to the Neolithic people of Scotland at least a thousand years before Plato, as demonstrated by the stone models pictured in Fig. 1 which date from this period and are kept in the Ashmolean Museum in Oxford. Figure 1. Stone models of the cube, tetrahedron, dodecahedron, icosahedron and octahedron. They date from about 2000 BC and are kept in the Ashmolean Museum in Oxford. Various people including John McKay and myself spread this story without examining it very critically. I did read Dorothy Marshall's excellent paper "Carved stone balls", which catalogues 387 carved stone balls found in Scotland, dating from the Late Neolithic to Early Bronze Age. It has pictures showing a wide variety of interesting geometric patterns carved on them, and maps showing where people have found balls with various numbers of bumps on them. But it doesn't say anything about Platonic solids. Left: balls with 3 or 4 knobs. Right: balls with 6 knobs. ... where's the icosahedron? The fourth ball sure looks like one but only because someone added ribbons, connecting the centers of the different knobs. If this ribbon-figure is an icosahedron, the ball itself should be another dodecahedron and the ribbons illustrate the fact that icosa- and dodecahedron are dual polyhedra. Similarly for the last ball, if the ribbon-figure is an octahedron, the ball itself should be another cube, having exactly 6 knobs. Who did adorn these artifacts with ribbons, thereby multiplying the number of "found" regular solids by two (the tetrahedron is self-dual)? But is this really true? Le Bruyn discovered that the Ashmolean owns only 5 Scottish stone balls - and their webpage shows a photo of them, which looks quite different than the photo in Lawlor's book! They have no ribbons on them. More importantly, they're different shapes! The Ashmolean lists their 5 balls as having 7, 6, 6, 4 and 14 knobs, respectively - nothing like an icosahedron. And here is where I did a little research of my own. The library at UC Riverside has a copy of Keith Critchlow's 1979 book Time Stands Still. In this book, we see the same photo of stones with ribbons that appears in Lawlor's book - the photo that Atiyah and Suttcliffe use. In Critchlow's book, these stones are called "a full set of Neolithic 'Platonic solids'". He says they were photographed by one Graham Challifour - but he gives no information as to where they came from! ... the author has, during the day, handled five of these remarkable objects in the Ashmolean museum.... I was rapt in admiration as I turned over these remarkable stone objects when another was handed to me which I took to be an icosahedron.... On careful scrutiny, after establishing apparent fivefold symmetry on a number of the axes, a count-up of the projections revealed 14! So it was not an icosahedron. It seems the myth of Scottish balls shaped like Platonic solids gradually grew with each telling. Could there be any truth to it? Dorothy Marshall records Scottish stone balls with various numbers of knobs, from 3 to 135 - but just two with 20, one at the National Museum in Edinburgh, and one at the Kelvingrove Art Gallery and Museum in Glasgow. Do these look like icosahedra? I'd like to know. But even if they do, should we credit Scots with "discovering the icosahedron"? Perhaps not. So, it seems the ball is in Theaetetus' court. It's not a scholarly tome: instead, it's a fun and intelligent introduction to Euclid's Elements with lots of interesting digressions. A great book for anyone interested in math! 7) Benno Artmann, Antike Darstellungen des Ikosaeders, Mitt. DMV 13 (2005), 45-50. 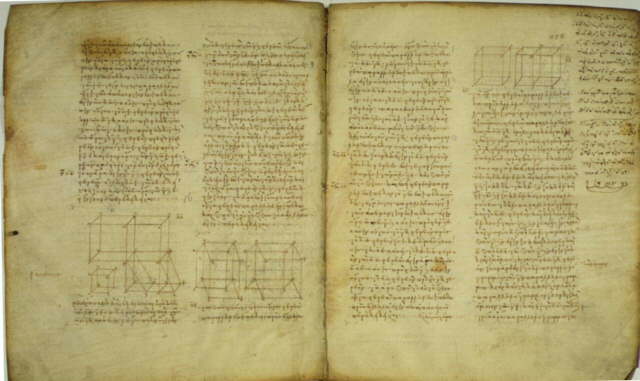 10) Thomas L. Heath, A History of Greek Mathematics. Vol. 1: From Thales to Euclid. Vol. 2: From Aristarchus to Diophantus. Dover Publications, 1981. 11) William C. Waterhouse, The discovery of the regular solids, Arch. Hist. Exact Sci. 9 (1972-1973), 212-221. 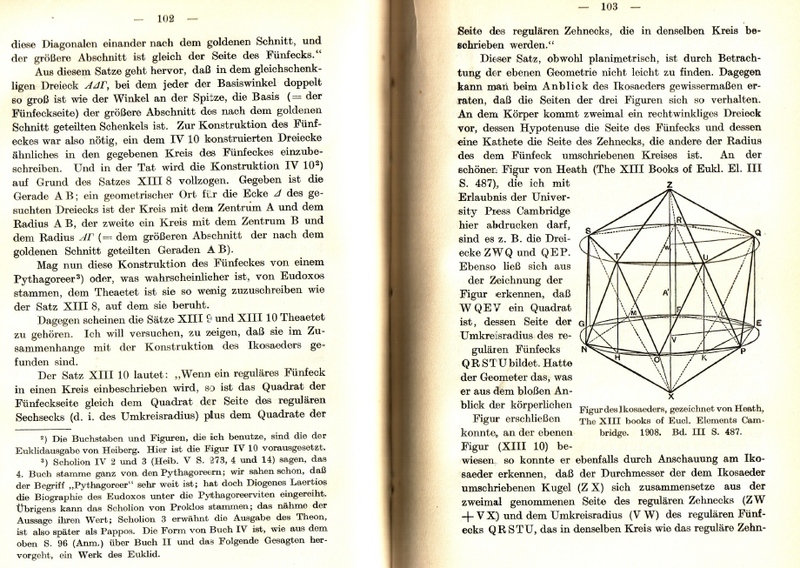 12) Eva Sachs, Die Fünf Platonischen Körper, zur Geschichte der Mathematik und der Elementenlehre Platons und der Pythagoreer, Berlin, Weidmann, 1917. 13) N. M. Swerlow, The Recovery of the exact sciences of antiquity: mathematics, astronomy, geography, in Rome Reborn: The Vatican Library and Renaissance Culture, ed. Grafton, 1993. 14) Michael Atiyah and Paul Sutcliffe, Polyhedra in physics, chemistry and geometry, available as arXiv:math-ph/0303071. 16) Keith Critchlow, Time Stands Still, Gordon Fraser, London, 1979. Finally, a bit of math. 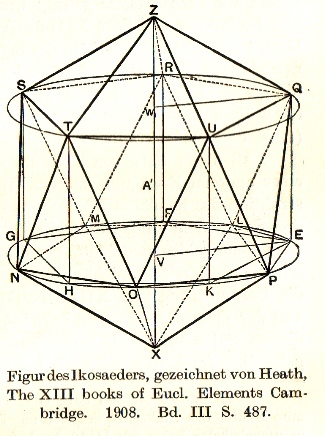 In the process of researching my talk, I learned a lot about Euclid's Elements, where the construction of the icosahedron - supposedly due to Theaetetus - is described. This construction is Proposition XIII.16, in the final book of the Elements, which is largely about the Platonic solids. This book also has some fascinating results about the golden ratio and polygons with 5-fold symmetry! The coolest one is Proposition XIII.10. It goes like this. Take a circle and inscribe a regular pentagon, a regular hexagon, and a regular decagon. Take the edges of these shapes, and use them as the sides of a triangle. Then this is a right triangle! We can prove this using algebra - but Euclid gave a much cooler proof, which actually find this right triangle hiding inside an icosahedron. First let's give a completely uninspired algebraic proof. This says that the center of mass of the pentagon's corners lies right in the middle of the pentagon. Now, quartic equations can always be solved using radicals, but it's a lot of work. Luckily, we can solve this one by repeatedly using the quadratic equation! And that's why the Greeks could construct the regular pentagon using a ruler and compass. A fact we should have learned in high school, but probably never did. That wasn't so bad, but imagine discovering it and proving it using axiomatic geometry back around 300 BC! How did they do it? 20) Ian Mueller, Philosophy of Mathematics and Deductive Structure in Euclid's Elements, MIT Press, Cambridge Massachusetts, 1981. This is reputed to be be the most thorough investigation of the logical structure of Euclid's Elements! And starting on page 257 he discusses how people could have discovered P2 = H2 + D2 by staring at an icosahedron! This should not be too surprising. After all, there are pentagons, hexagons and decagons visible in the icosahedron. But I was completely stuck until I cheated and read Mueller's explanation. 5 vertices forming a pentagon: the "upper pentagon"
5 vertices forming a pentagon: the "lower pentagon"
the length BC equals the edge of a decagon inscribed in a circle. Different circles, but of the same radius! What's this radius? The 5 vertices of the lower pentagon lie on the circle shown in blue. This circle has the right radius. To prove this, it would suffice to show the following marvelous fact: the distance between the "upper pentagon" and the "lower pentagon" equals the radius of the circle containing the vertices of the upper pentagon! The right triangle ABC is shown here. The trick is to construct another right triangle AB'C'. Here B' is the top vertex, and C' is where a line going straight down from B' hits the plane containing the upper pentagon. Remember, we're trying to show the distance between the upper pentagon and lower pentagon equals the radius of the circle containing the vertices of the upper pentagon. But that's equivalent to showing that AC' is congruent to AC. To do this, it suffices to show that the right triangles ABC and AB'C' are congruent! Can you do it? In the references to Mueller's book, he says the historians Dijksterhuis (in 1929) and Neuenschwander (in 1975) claimed this is "intuitively evident". But I don't know if that means it's easy to prove! I thank Toby Bartels and Greg Egan for help with this stuff. I also thank Jim Stasheff for passing on an email from Joe Neisendorfer pointing out Mellinger's picture of the Milky Way. can be solved by solving first one quadratic and then another. Luckily, we can solve this one by repeatedly using the quadratic equation! So while I said this proof would be uninspired, it did require a tiny glimmer of inspiration. With this observation above, I'm trying to convince you that the proof really is completely uninspired To solve the quartic by solving two quadratics, you need to locate the degree 2 subfield of Q(z) (z=ζ5) and aim towards it (because it's your route to the solution). This subfield is clearly the real numbers in Q(z), and the real numbers in Q(z) contains z+z*=z+z-1. So that's sort of a completely conceptual explanation of why the trick works and why it's crucial to introduce z+z-1. Here ζ5 is number-theorist's jargon for a "primitive 5th root of unity", which in turn is number-theorist's jargon for any 5th root of 1 except for 1 itself. Greg Egan gave a nice modern version of Euclid's original proof of Prop. XIII.10, which states that if you take take a circle and inscribe a regular pentagon, a regular hexagon, and a regular decagon, and make a triangle out of their sides, it's a right triangle! Here's a version of the proof Euclid gave, adapted from the version JB cited. Rather than proving that various angles here are identical, I've just written in the (easily established) numerical values; there's nothing tricky here, so we might as well take them as given. Triangle BAK is similar to triangle KAN. So BA/AK = KA/AN. Thus AK2 = AB · AN. Adding our two results, we have: BF2 + AK2 = AB · (AN + BN) = AB2. BF is our radius, AK is a decagon side, and AB is a pentagon side. Well done Euclid. On Thanksgiving of 2009, I got ahold of Eva Sachs' 1917 book Die Fünf Platonischen Körper, mentioned above. It's supposed to be the authoritative tome on the early history of the Platonic solids. Proving that these are congruent is the key to the pentagon-decagon-hexagon identity! I'm especially curious about the footnote on page 104, and also the remark further up this page saying "So fand er den Satz XIII 9..." ("This is how he found Proposition XII.9"). To see Greg Egan's beautiful proof of the pentagon-decagon-hexagon identity, which meets my challenge above, see "week284".